I almost missed this, even knew it was coming up, and I almost missed it. This week (September 27 – October 3 2015) is Banned Book Week. Freedom of speech is a biggie for me. In the US we are guaranteed this freedom in our constitution. This is more than just the right to blatantly proclaim whatever it is you feel. The importance of this freedom is the idea that even the person you don’t agree with has a right to say what they feel. Too often we seek to shut down the views we oppose, to push away those we don’t agree with. When we do this, we diminish ourselves. I have begun to wonder at times if, when I am writing these bits, I am in a confessional. It seems like when I get into a good bit of stories I end up confessing to my failings as a geek and a reader and all that stuff. Or maybe I am just a dork who doesn’t know any better. Either way I am just flapping my gums right now as I am looking for an opening into the topic of the moment. I didn’t know who Neil Gaiman was a few years ago. Seriously, no clue who he was. I loved the movie for Stardust, even saw Coraline, and still not a touch of an inkling who the man was. That sounds crazy doesn’t it. But it also gives us an idea of what happens within our literary landscape. There are so many classic stories and writers and I can guarantee you probably haven’t read all of them. There are books on your list that you may never get to. You want to read them, you plan to read them, you might even own the books. But you haven’t read them yet. And this is the authors that you know. But I didn’t know who Neil Gaiman was. And I didn’t know how much I loved his stories. And you know what’s stranger about all this? I didn’t even come into his stories through him. I had read a story about Amanda Palmer and her kick starter campaign that raised a vast sum of money. And then I started listening to her music. And I investigated. I learned a few things about her and found out she was married to Neil. So I had to know who he was. And I read the book for Stardust. And then I read another story of his (How to Pick up Girls at Parties). My relationship grew. Did you know we are best friends, well he doesn’t know this yet (now I sound like a creepy fan). Sorry we should draw back a little here before this goes too far south. 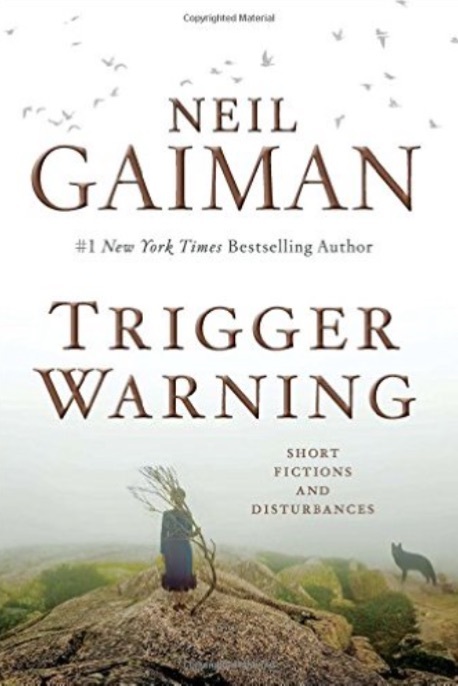 Long story short, I heard about this book, Trigger Warnings. A collection of his short stories, an effort to fight back against the semi censorship that has been building of people trying to fight against the stuff that makes them feel icky. Had to read it, I mean this is a moral imperative. So as I am getting ready to write this, I went back through the introduction and ran across a couple quotes that I think are perfect for this moment. Though he has warmed a little to the idea of a trigger warning to prepare a reader for something that could be questionable he also made this statement. And then a bit further he mentions the whole trigger warning concept at colleges and how those pertain to his own work (his work has been put on watch lists and threatened with banning). His thought was to put the trigger warnings in place before anyone else did. And that was the whole concept of the stories. These are stories that will hit the reader in so many different ways. I do have a minor complaint here. The introductions for the individual stories were placed at the introduction for the book as a whole. Personally I would have rather had them with the stories that they connected with. That way I wouldn’t have to flip back and forth, but I am lazy. All that flipping is more work than I care for… But that is a minor quibble. The stories within the book fall into different lengths and allow you to enjoy them in quick bursts or long explorations, they are the perfect little interludes for the toils of our day. (ready? Time for another quote) “I firmly believe that short-story collections should be the same sort of thing all the way through. They should not, hodgepodge, and willy-nilly, assemble stories that were obviously not intended to sit between the same covers. They should not, in short contain horror and ghost stories, science fiction and fairy tales, fabulism and poetry, all in the same place. They should be respectable. I won’t bore you now with a huge rundown of all the stories within the collection. But I want to bring up at least a few thoughts on one story. The one that hit me the hardest. Granted there are a number of stories that I can still picture, but it was the last story, Black Dog, that just ripped into my soul. Through a collection of great stories, that was the story that made the whole thing worth it for me. Hell, I could have gotten a book with just that story and felt like I came out ahead. I won’t go into any of the details. Personally, I would rather you spent some time with this one on your own, and it is still fairly new enough that not everyone has had a chance to read it yet. But that story gave me chills. I have no qualms admitting that there are some images in that one that will stay with me forever. I could go on forever telling you nothing about the book but still gushing over the brilliance that is Mr. Gaiman, but that gets boring after a while. Instead it would be better if you pick up a copy yourself and then we can talk to each other about the stories we loved from the book. And of course you may wonder what kind of lesson we can pull from all of this. And that is when I bring you back to the beginning. There are writers in the world that we may not know we like, we haven’t been exposed to enough of their work. But there are always stories we love, we always come back to the stories. But be ready, when you have run across enough stories that you love and you see who they are coming from, you may find that you want more and more of their work. The addiction is formed at the first taste. Mr. Gaimen is no stranger to his stories being challenged. He is a fighter for the rights of all story tellers to share the stories they wish to share. The moments when we read something that shares a part of the world we don’t agree with, we are given an opportunity to grow and become more than we are. Normally, I would take this time to ask you to drop a couple coins in the hat or maybe consider making a recurring donation through my Patreon page. But this week, I would like to direct you to something I feel important and actually fitting for Banned Book Week. Take a moment to check out this week’s Humble Bundle of banned graphic novels. Not only will you end up with some pretty stellar comics but part of your purchase is donated to the CBLDF (Comic Book Legal Defense Fund). This is a great cause to help support our freedoms of speech and press. 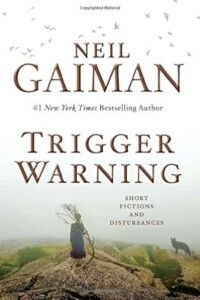 6 Responses to "Trigger Warning #Bannedbookweek"
I really need to read some of Gaiman’s work one of these days. I’ve watched a few of his YouTube type videos and love his personality and some of the things he has to say. I have been working through a number of his stories over the past year. There are so many places that he takes you. Thanks for the intro to Gaiman – not familiar with his work. Glad you did a Banned book week post (as did I) as I really don’t think its as well known as it should be. And lagnape was a new word on me so I had to look it up – its actually lagniappe according to wiki. But its a good one, and can’t wait to find a sentence to use it in. You found one of my weaknesses. I am horrible at spelling, especially when I use fancy words. Neil Gaiman is one of those interesting writers that are pretty much everywhere, but are almost unheard of. Such is the fun of a writer’s life. Thanks for the intro to Gaiman and I will look him up for sure, based on your recommendation. I can’t tell you how many things I read that I really dislike, yet I’d fought for those writings should they ever face a banning. Galling the whole banning thing. But then, so is political correctness. To me it’s the same thing. We are of the same mind. Thought police are a horrible thing that has been unleashed upon the world.